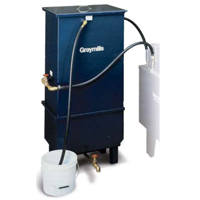 Graymills is committed to providing solutions to your fluid needs, be they filtration, oil removal, or a combination of those items in a bundled package. Our rugged, heavy-duty Bed Filter Tank Systems are available in 31, 41, 54 and 67 gallon tank sizes. The Magnetic Separator may be added to the Bed Filter Tank System for multi-layer protection or used alone where there is ferrous metal contamination. Permanent magnet and reusable stainless steel cartridge trap ferrous particles, scale, and contaminants to prevent costly damage. Collects up to 20 cu. in. of material without pressure drop. All the benefits and features of the Superflo™ while enabling smooth, filtered flow from reciprocating-type pumps. Designed for the separation and removal of emulsified and free oil from water-based machine tool coolants and cleaning fluids.